Blake loves watching a few cartoons over on Cbeebies he has a few favorites that I let him watch near enough everyday. I was recently contacted and asked if I would love a copy of Q Pootle 5's new DVD, Pootle the Explorer. Now I've never heard of Q Pootle 5 and Blake had never watched it before. I thought it would be something a little different for him to watch whilst I am doing the chores to keep him entertained for a bit. Q Pootle 5 is based on the best-selling books by the hugely popular children’s author and illustrator Nick Butterworth and the series features an outstanding voice cast including: Ed Gaughan, Joanna Page, Steven Kynman, Richard Ridings, and Ella Kenion. Blake seemed to like the DVD as when I put it on he was straight to the TV standing up watching the episodes. Q Pootle 5 is a series that will spark imaginations and raise a smile from children and parents alike. 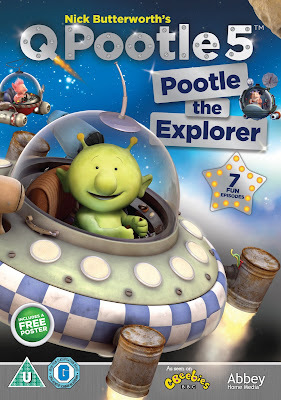 Q Pootle 5, Pootle the Explorer is released today (11th April 2016) and retails at £7.99. Inside the DVD box you will also find a free poster. Now, how would you like to win a copy of Q Pootle 5: Pootle the Explorer on DVD? He looks like a really cute little Alien. Bubs is the same when we are at my mum and dads house he will want to stand right in front of the TV like Blake. Luckily at home its right up on the wall where he can't get to it. Will enter this fab little comp. I am sure both of my boys will love it. great compeititon for little people I am sure. I have never heard of this series before and I thpught I was familiar with most facets of kids TV! It looks like Blake is a definite fan! Awww, he looks so cute, watching his favourite DVD! Emma used to love them, they are very educative and quite fun! My daughter loves Q pootle too! I must admit I quite like it as far as kids TV programs go it's not horrific! There are no longer any young kids in my house, so I have the pleasure of not knowing the latest cartoons and kids shows. Q pootle looks a lot like In The Night Garden to me! I have never actually heard of this programme. I must turn it on for the kids one evening. We never watch cbeebies. Looks like a nice alternative to the same (always the same) program that's on in our house! My little sister would love this maybe I should enter the competition for her. This sounds like something my nephews would love. Gosh kids programs have changed a lot since I was a kid! A fab little comp for those it would be interested!